Anytime you receive a moving violation in MA the conviction is likely to increase your insurance and cause points to accrue to your driver’s license. However, being found guilty of a speeding ticket in Massachusetts is particularly problematic because a speeding conviction has an amplifying effect on your insurance rates, points, and suspension of driving privileges. For example, did you know that in NY if you receive 3 or more speeding convictions in an 18 month period your driver’s license gets revoked for at least 6 months? In Illinois, it’s 2 or more speeding convictions in a 12 month period, even if the conviction occurred outside of Illinois. For a New Jersey motorist, the NJ DMV records all speeding convictions to your NJ record no matter what state you were convicted in. 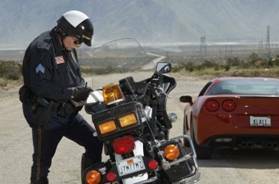 Pennsylvania records Florida speeding convictions, and if your Florida driving privileges are suspended and you have a Pennsylvania driver’s license, Pennsylvania suspends your license as well. In Iowa, a single conviction for driving 25 MPH or more over the speed limit results in a license suspension, and out of state convictions count. Further in most states, fines are doubled when convicted for speeding in a school or work zone, and it is a more serious insurance “merit system” violation. The above are just a handful of the problems that a speeding conviction can cause a motorist, as the problems they cause varies from state to state. However, just because you received a speeding ticket does not mean that all hope is lost and does not mean that you are guilty. Viable defenses are available to you. The vast majority of states do not allow a jury trial in a speeding ticket case. This means that your case will be heard by a judge. The trial starts with the state calling the police officer to testify. After the police officer is done with direct testimony your lawyer will have the right to question him, called “cross examination.” Even though improper, the judge often jumps in with questions of his own. Once the state is done with the police witness they “rest.” At this point your lawyer can, and often does, move for a dismissal, called a “directed verdict.” What the defendant / motorists argues is that the evidence, viewed in a light most favorable to the prosecution, fails to make a “prima facie” showing that the defendant / motorist committed the infraction. If it is granted the case is over; if not the case continues for the defense to present their case and evidence. Except in rare cases, a traffic ticket defendant never has to take the stand. However, in Massachusetts a traffic ticket is strictly a civil matter so if the motorist does not want to take the stand he can be compelled by the prosecutor. Whether or not the motorist takes the stand he or she can still present a case. He can call other witnesses such as passengers, and offer into evidence documents and photos. After the motorists is done he or she “rests.” And again, he can make a motion to dismiss called in this case a “motion to dismiss.” The argument this time is that a conviction would be as a matter of law “against the weight of the evidence.” If granted, the case ends right there; if not the case continues for closing arguments. During closing arguments you are arguing facts and the evidentiary standard. The prosecution argues that they met their burden by “clear and convincing” evidence or “proof beyond a reasonable doubt,” as the case may be, and the motorist argues that, as a matter of fact, the prosecution has not proven their case by the evidentiary standard of the jurisdiction. Often times, when these efforts do not lead to an outright acquittal, they lead to a conviction of speeding to a slower speed then alleged. This often means less of or no insurance increase, and if there was a threat of suspension no suspension, a briefer suspension period, or eligibility for conditional driving privileges during a suspension period. After the cop nails you in Massachusetts, who is on your side? Attack That Ticket MA. That's who.